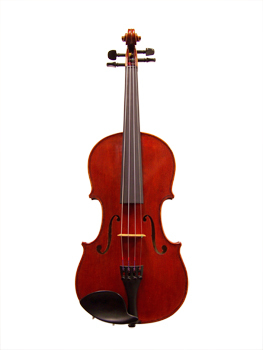 A beautiful, handmade, hand varnished violin made in Beijing, China. Workmanship, wood quality, and tone are a distinctive improvement from the model above. Tone is clear, bright and projects well. The varnish is a red-brown oil, evenly hand applied. This traditionally crafted instrument has become our most popular instrument for beginners of all ages. The adjustment includes ebony fingerboard, pegs, and chinrest, composite tailpiece with built-in fine tuners, and LVS synthetic core strings. The small instrument sizes are very well done with proportional dimensions.